Thank you to everyone that helped me celebrate! There are more parties to come as this little blog grows. 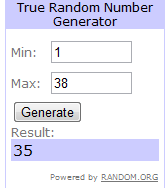 The winner of the 100 follower giveaway is…AUBREY LAINE! I just sent you an email Aubrey, check yo’ inbox girl!